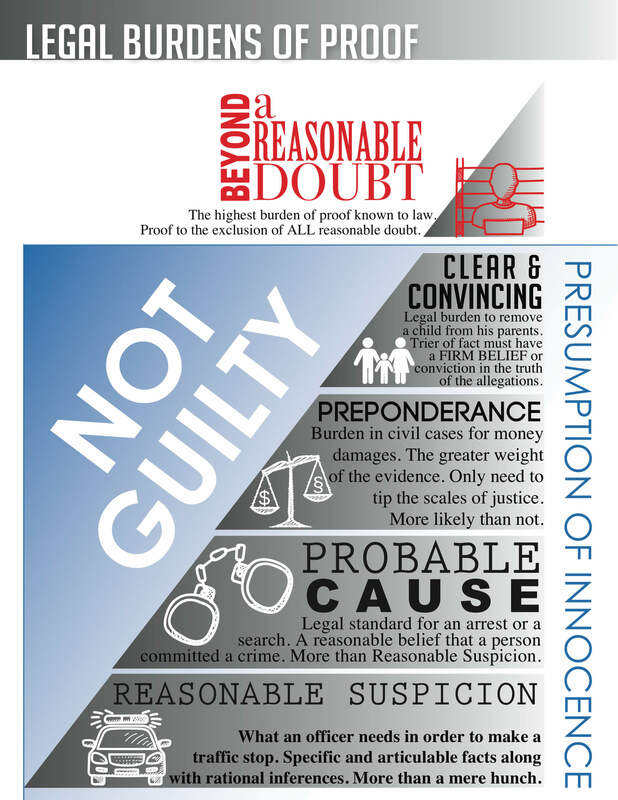 Visuals Can Help Explain the Burden of Proof During Voir Dire and Trial. 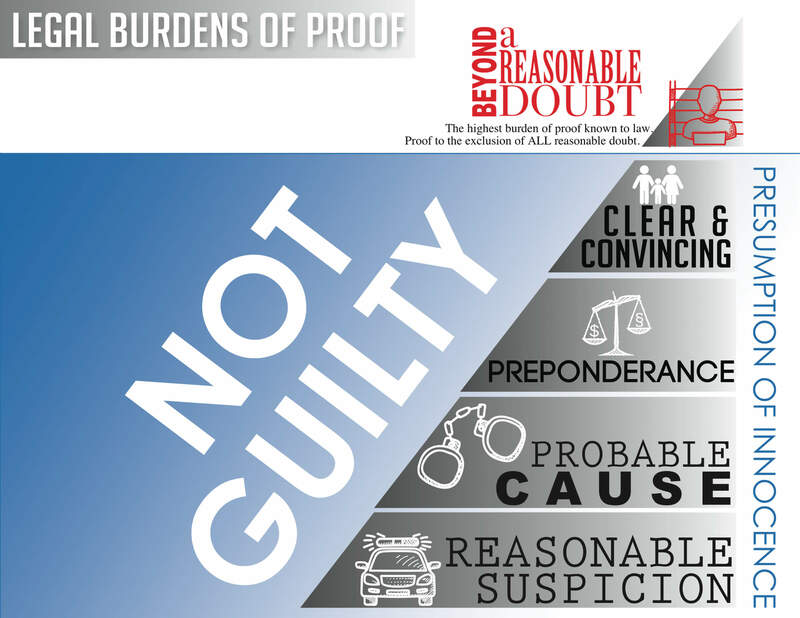 One of the goals of every criminal trial lawyer during jury selection (voir dire) is to educate the venire panel on the various burdens of proof. More specifically, criminal trial lawyers must explain the meaning of “Beyond a Reasonable Doubt.” It is critical that the jury understand that Beyond a Reasonable Doubt is the highest standard known to the law and that if there is any reasonable doubt the jury must return a verdict of Not Guilty. With the technologically-immersed culture in which we live, there is no doubt that our jury pool has a much lower attention span. Lawyers, who in times past could speak to the jury and teach them about the burden of proof, must now show them. 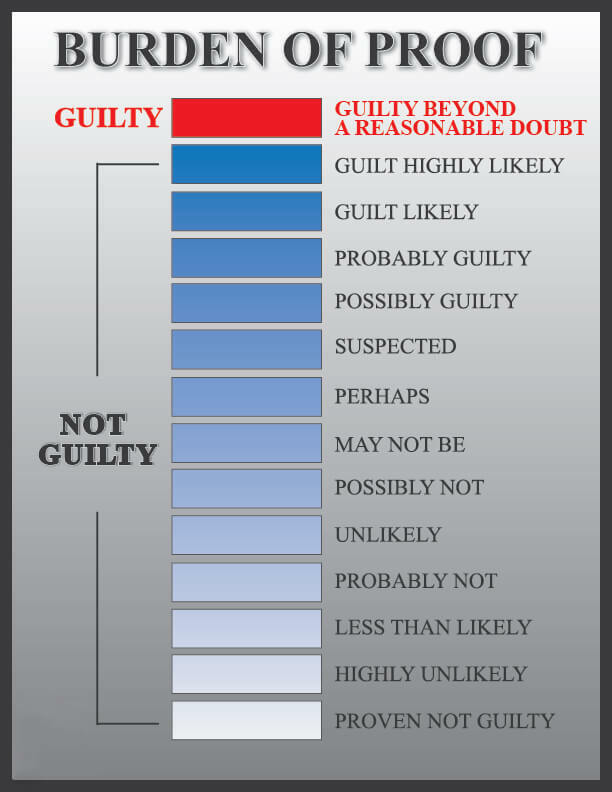 Whether we use PowerPoint slides, Posters, or other media, a jury can better digest our argument if it is reinforced by media. 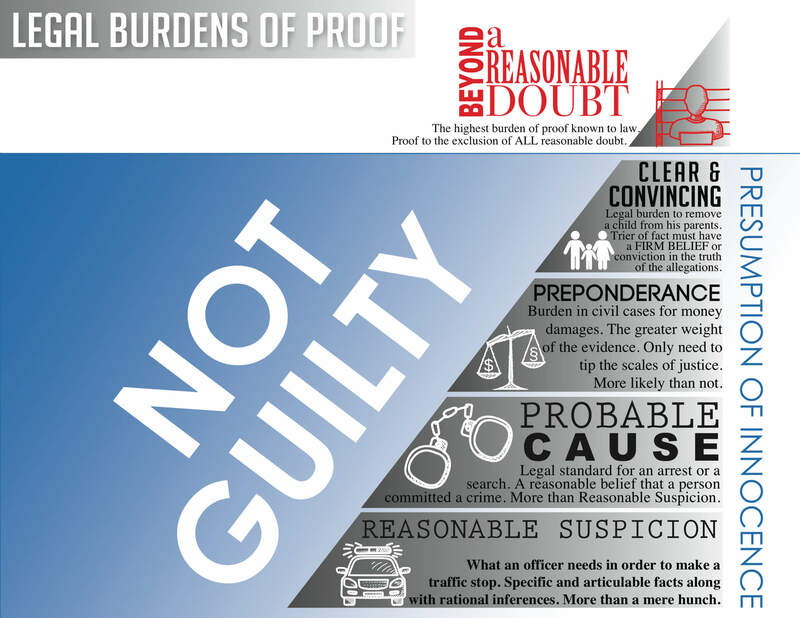 Our criminal trial lawyers considered this and came up with the following graphics to portray the various burdens of proof. 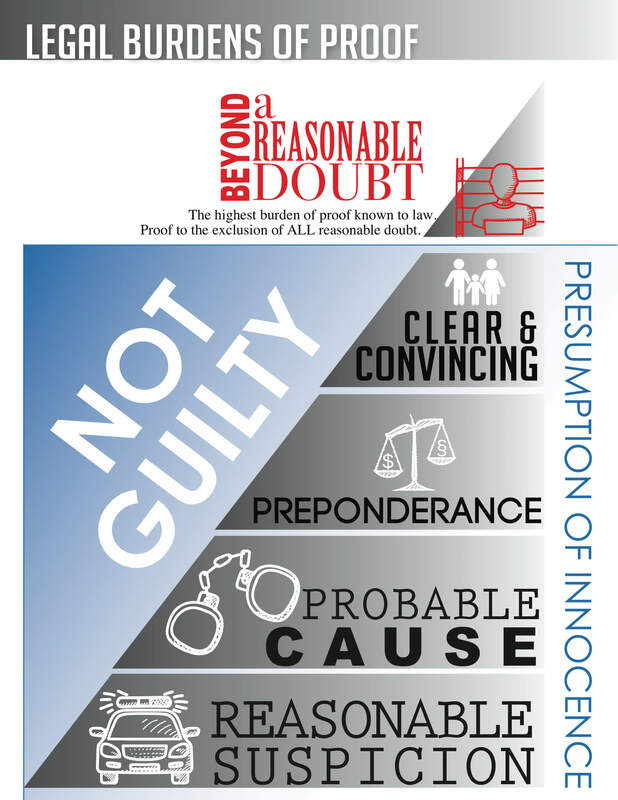 We use these images during jury selection and during argument to educate the jury and reinforce the importance of the burden of proof and the presumption of innocence. Burden of Proof Images. Free to Download and Use in Trial. We have provided our burden of proof images and slides below for you to use if you want. If you click on the image, you will see the full-size, high resolution version (depending on your screen size). You’ll notice that there are two versions (one vertical and one landscape). We’ve found that the landscape version is better as a PowerPoint slide. You’ll also notice that we have removed the explanations of the burdens of proof on one set of images. This is so that you can explain the burdens in your own words rather than ours (it is also a cleaner, less busy version). Again, feel free to use these slide if you like them, or use them as inspiration to create your own. *If you decide use these images on your website, please provide a link back to this page as the original content. Thanks. Barnett Howard & Williams is a boutique criminal defense firm in Fort Worth, Texas. Our attorneys handle all felony and misdemeanor cases in Tarrant County and some surrounding areas. If you are under investigation or if you have been charged with a crime, you need a proven team of criminal defense lawyers to fight for you in the courtroom. Contact our firm today for a Free consultation of your criminal defense matter at (817) 993-9249.